A study on Chinese attitudes to organ donation has been retracted by its authors because they object to the journal Transplantation publishing a letter that is critical of their article. This is not just a case of study authors being hypersensitive about their work - rather, the authors object to the 'criticism of the political situation' in China contained in the letter. 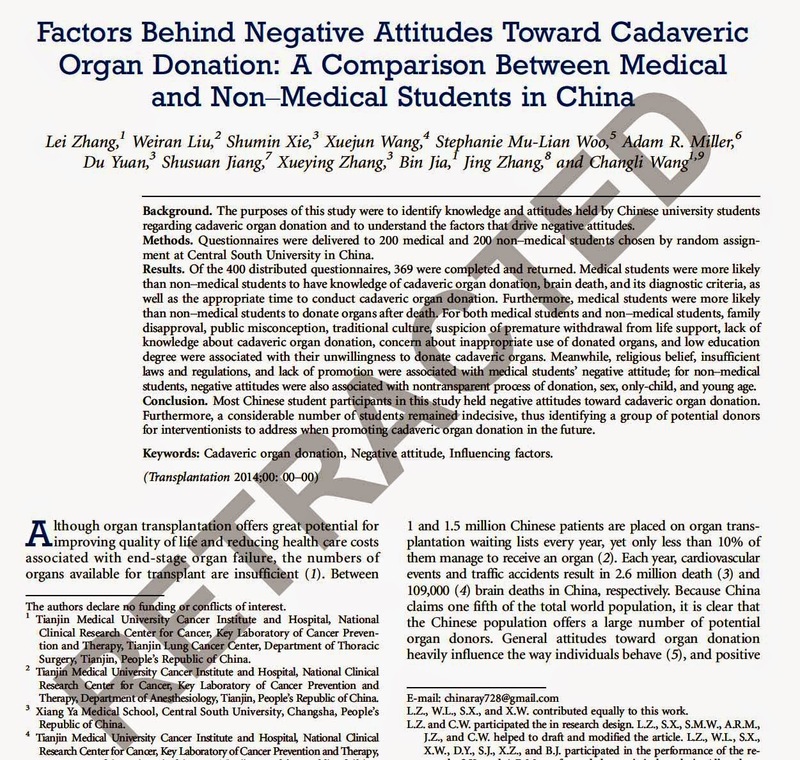 The study in question is titled: "Factors Behind Negative Attitudes Toward Cadaveric Organ Donation: A Comparison Between Medical and Non-Medical Students in China". It was published online by Transplantation in May 2014, and seems fairly straightforward. The survey of 400 Chinese university students found they were generally against organ donation. The actual numbers were: 48% of students would refuse to have their organs donated, 37% were not sure and only 15% would agree to organ donation. Attitudes were more positive among medical students: 32% would agree to organ donation and only 27% would definitely refuse: 41% were not sure. The main factors behind the negative attitudes to organ donation were traditional Chinese culture and family disapproval, mistrust of the medical system and how the organ donations might be used, plus suspicion of premature withdrawal from life support. Religious beliefs and wariness about the nontransparent process of donation were also factors in opposing organ donation for some Chinese students. 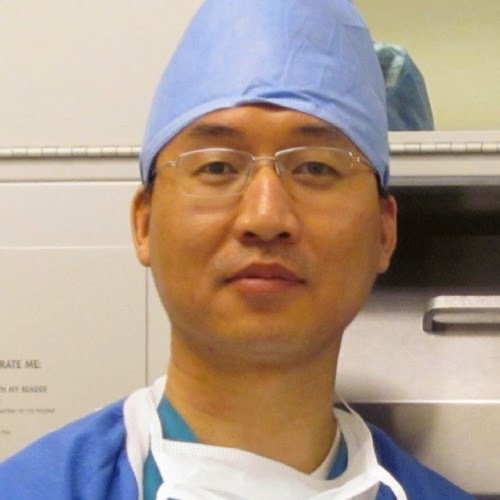 The study's lead author is Associate Professor Zhang Lei, a lung transplant surgeon at the Tianjin Medical University Cancer Institute, with various co-authors from other Chinese hospitals and universities. Two of the co-authors are listed as being at Harvard and Indiana universities in the US. The study authors conclude that there is little enthusiasm for organ donation in China, due to the above listed factors - but they end on a positive note, saying the large number of 'don't knows' suggests there is potential for many Chinese to be persuaded about organ donation. So far, so good. But the Transplantation website now says the article has been retracted at the insistence of the authors. The reason given by the authors: "because the editors [of Transplantation] insist on publishing a Letter to the Editor that is critical of the article and that, in the view of the authors of the article, is unjustified since it extends to criticism of the political situation of organ donation in China and the failure of the article to take this into account." The offending letter does not yet seem to have been published. I can only guess that it refers to the controversial and murky area of organ transplantation in China. We're all aware of the stories of organ trafficking and the use of organs from executed prisoners. There are the claims made by a certain quasi-religious meditation group (who I will not name because it will get this blog blocked within the PRC) about organ harvesting. The fact that even mentioning the name of FLG is enough to have a website blocked in China shows the continuing sensitivity around the group in that country - and among the people who work there. Perhaps this is the reason why Dr Zhang has asked for his paper to be retracted: maybe he does not want to get into a debate about 'the group with no name' - or even see his name on the same page as them. The question remains whether Dr Zhang retracted this paper on his own initiative (self censorship) or on advice/orders from others higher up the chain? The retraction seems futile, symbolic and self-defeating: futile because the study is still online, but with the word "Retracted" stamped across it, so it is still possible to read the findings. It's symbolic because the authors are not retracting their work due to it being unsound - only because they disagree with criticism of it. And political criticism at that. Retracting a study because of 'political' criticism is not in the spirit of science or academic discourse. Being willing and able to defend your work from critical review is one of the foundations of good science. What if Darwin had retracted Origin of the Species because he was unwilling to have John Murray publish a critique of it? And this makes it self defeating - all that Dr Zhang has done is draw attention to an act of anti-scientific self censorship. The attitude seems to be "you may only publish our research if you promise not to publish others who are critical of our government". Compare this refusal to engage with the very robust debate on the sensitive issue of Gaza currently taking place in The Lancet, with views from all sides. It makes Chinese researchers look intolerant of scientific discussion and unable to handle academic debate. Not a good look for a country that aims to catch up with the developed countries in science and technology. The retraction raises a whole raft of worrying questions. Does this set a precedent for China? Will Chinese researchers only publish in compliant journals that agree not to publish letters that criticise the political situation in China? Will China put pressure on publishers who publish critical comments? This is a real possibility, as scientific publishers such as Elsevier are keen to expand in China. "Let a hundred flowers bloom and a hundred schools of thought contend". Either that, or submit the paper for publication in the North Korea Medical Journal. [Editor's note: This is a blog, not a media outlet, but if Dr Zhang or any of the co-authors are reading this and want to 'have your say', I'm happy to update this post and include your take on this].